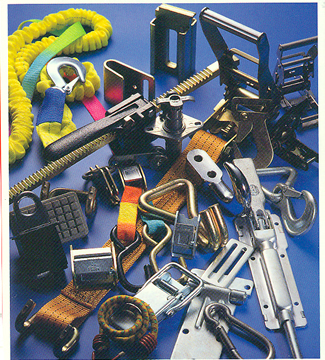 J. H. Nunn Cargo Control Products secure loads with tie down straps utilizing Ratchet Buckles, Cam Buckles, Overcenter Buckles, Nylon Webbing and a variety of end hardware. We offer custom assemblies to fit your particular application with rated breaking strengths from 300 to 10,000 lbs. Our tie down ratchets allow loads to be secured by repeatedly pressing the ratchet lever down to tension the webbing and to stabilize the cargo that is being tied down. 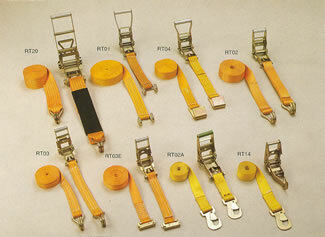 Ratchet Tie Down Straps are primarily used in applications where maximum tensioning is required. Tie Down Ratchets are extensively used in Sea Land Cargo Containers to stabilize the loads. They are also used frequently on trucks to secure cargo and on material handling equipment to keep objects and items from shifting. Our Ratchet Tie Down Straps are very versatile because they can be custom fit with end hardware that will accommodate webbing widths of 1 inch, 2 inches, 3 inches, and 4 inches. 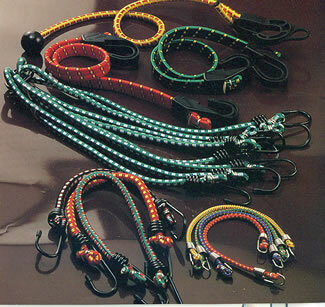 Our hooks include Single and Double Wire Hooks and Wire S Hooks. 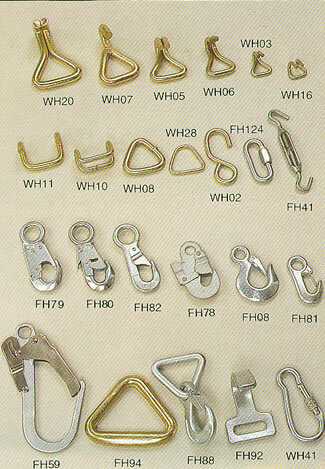 We carry stamped and forged Safety Hooks with spring Latches, along with Twisted Flat Hooks and D Rings. 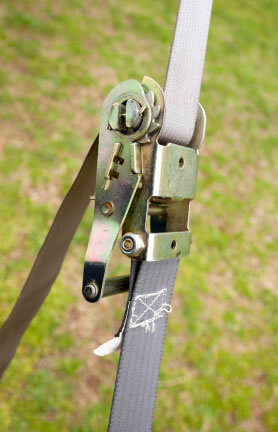 Our Quick Disconnects, Threading Plates and Anchor Plates make our Ratchet Tie Down Straps very useful in many different applications. 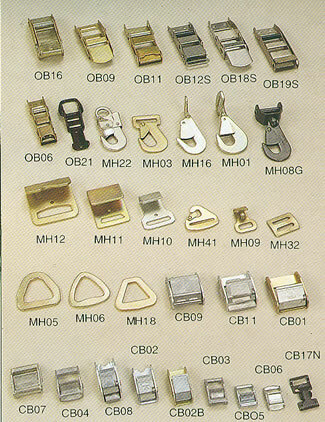 Most of our cargo control hardware is cadmium plated for corrosion resistance. We do offer stainless steel hardware for particularly corrosive environments such as the Marine Environment. 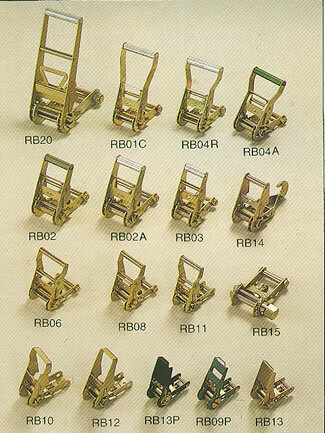 Cam buckles and over Center buckles are particularly useful in providing tensioning capability in lower weight capacity applications that don't require the high leverage tensioning provided by a Tie Down Ratchet. 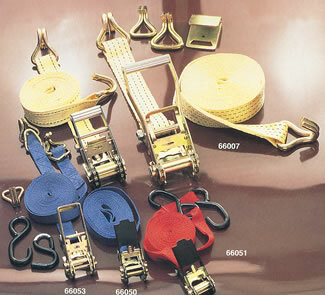 Cam Buckles and over Center Buckles are lower profile, lower weight and lower cost than Ratchet Buckles. 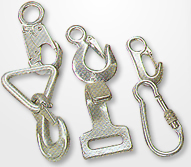 Cam and Over Center Buckles can secure gas cans, water cans, toolboxes, battery boxes and oxygen tanks to vehicles. 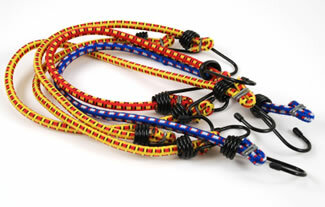 They also can be used very effectively in protecting delicate and expensive equipment from earthquake damage. Cam buckles can very effectively secure sensitive devices when they are being transported on material handling equipment such as carts, bins and pallets. Contact JH Nunn to order the products you need, or to learn more.